Red-whiskered Bulbuls are an introduced species but have not proliferated to such an extent as some of our other foreign birds. Originally released in Sydney in the late 1800's and from near Melbourne in the mid 1900's they have spread very little and usually only very near to human habitation. In NSW they have reached the Shoalhaven River and are common at Nowra. They also occur down the edges of the river to Comerong Island. Northwards they have reached Coffs Harbour. In Queensland, there is an isolated colony in the town of Mackay. In Victoria, there is a colony in the Melbourne Botanic Gardens and occasional reports around Geelong. Red-whiskered Bulbuls live as pairs in permanent territories, feeding in the trees and shrubbery on insects, fruit and berries. 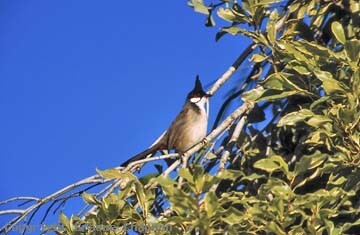 They have a distinctive song, immediately recognisable and unlike any Australian bird.